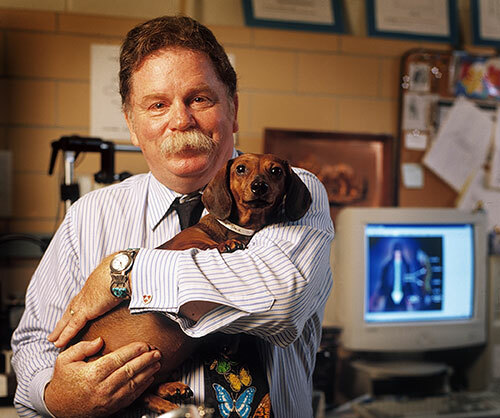 As part of a feature highlighting Purdue inventors and innovators that help move the world forward, Purdue Today recently focused on Dr. Richard Borgens, the Mari Hulman George Professor of Applied Neuroscience in the College of Veterinary Medicine and a professor of biomedical engineering. He also is the founding director of Purdue's Center for Paralysis Research and a founding board member and chief scientific officer for Andara Life Sciences, Inc.
Dr. Borgens, in collaboration with Dr. Riyi Shi, professor of basic medical sciences, and Andrew Blight (former Purdue professor), developed the drug Ampyra, which has received approval from the U.S. Food and Drug Administration for improving motor function in patients with multiple sclerosis. Ampyra is the first and only FDA-approved therapy addressing walking impairment in MS patients — one of the most difficult and pervasive challenges of the disease. In clinical trials, patients who took Ampyra demonstrated an increased walking speed, regardless of which of the four major types of MS they exhibited (relapsing remitting, secondary progressive, progressive relapsing or primary progressive). Researchers at Purdue developed the original concept and basic science, and conducted initial animal studies at Purdue's Center for Paralysis Research facilities. The first clinical testing of the drug in paraplegic canines occurred on the Purdue campus in the College of Veterinary Medicine. Dr. Borgens received his PhD in biophysics and experimental zoology from Purdue in 1977 and was a postdoctoral fellow at Yale University for three years. He earned his bachelor's and master's degrees from North Texas State University in 1970 and 1973, respectively. He was a National Paraplegia Foundation Fellow at Yale and worked at Jackson Laboratory and the Institute for Medical Research before joining Purdue's faculty in 1982. The Purdue Inventors & Innovators website also contains information about other Purdue faculty and alumni from business and industry; technology; medicine and health; and the food and consumer industries.